These jump starters are supplied and relied upon by large government fleet operations as well as Police Depts, Fire Depts and Armed Forces which is the best recommendation a product can get. "These jump starters are supplied and relied upon by large government fleet operations as well as Police Depts, Fire Depts and Armed Forces which is the best recommendation a product can get and we can only add that this we do like this jump starter for it's size and power!" The Micro-Start XP-10 is unrivaled for performance & quality in the mini jump-start segment. It was the TOP RATED Jump Starter by Consumer Reports. That says a tremendous amount about the quality and abilities of Antigravity products. This is our most powerful jump-starter & personal power supply (PPS). 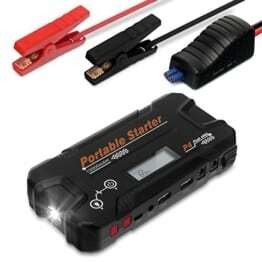 Only 9″x3.2″x1.2″ it’s small enough to fit in your hand yet has the amazing power to JUMP-START Diesel vehicles up to 7.3L, and any Car, Truck, Motorcycle or powersports vehicle. XP-10 has 300 Amps starting current with 600A Peak! It has proven to be the go-to device for professional mechanics as well as everyday Drivers, Riders and Travelers. Conveniently, XP-10 can also CHARGE & POWER most any of your devices. Four ports: 19V for Laptops (not compatible with Apple 16V laptops) + 12V standard output (for GPS, mobile DVD players, small fans, etc) + TWO 5V USB ports (for Smartphones, Tablets, Cameras, MP3 Players, Bluetooth devices, more). Massive capacity: 18000 mAh. MORE FEATURES: Hi-power 110-Lumen LED Flashlight built-in + Lighted battery capacity indicator + Automatic power-off when not in use + Built-in over-charge & over-discharge protections for long battery life. XP-10 comes with Leatherette Carry Case + Accessories. 1 home/wall Charger. Simply charge the Micro-Start once & take back-up power anywhere! Whether commuting, camping or traveling, be confident you can start your vehicle, make an important call or finish that last bit of work.